i am looking for a truth train. so i'm back in LA, and in the usual post-race (and post-vacation) process of picking up the pieces of normal mundane life. it's been a while since my last post, but things have been busy with catching up (or trying to). i'm still a little bit out of it with some weird jet lag (comes and goes) and all sorts of random issues...you know the feeling you get when you've just had a pivotal, momentous, deep, meaningful, all-changing, spiritual, soulful, dare-i-say-sacred experience, and then come home to find a pile of mundane frivolous useless superficial profane crap? obscene, yeah? just really wrong, yeah? just an insult to the sanctity of the magic that is life, yeah? while i sort out the conflict between the sacred and the profane, i figure i needed to at least post some things re IMNZ, and so compiled stuff together travel-related. i should note that this is NOT my race report (that will come later...and yes, it will be about girls and god, or in more academic parlance, about love and enlightenment--you know, the usual random assorted elements that seem to go towards this thing people occasionally call redemption, and if they're really daring maybe even salvation...but then, it's all just really the same thing, isn't it?). and oh yeah: i'm not religious. i'm just a pagan heathen with agnostic tendencies. ha ha ha yuck yuck yuck...sorry, jet lag kicking in. i won't do it again...or maybe i will. thanks again to ian and adrienne nairns--that's your photo at the top. you made excellent sponsors, and were so much more gracious and generous than any athlete could hope for. i hope that i wasn't too much of a burden on you. i promise i'll stay in touch, and hopefully i'll be doing IMNZ again soon and we can have the opportunity to meet up again. tallyho! 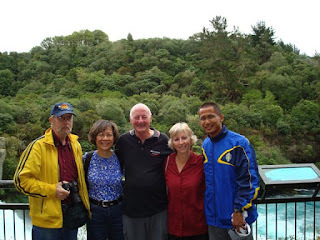 thanks to the gang at Endurance Sports Travel--ken, joe, dan, blair, lisa, frank, tai, aidan, you guys did an awesome job and made for a great experience. i hope to meet you guys again...and if you're ever around Los Angeles (or the USA), give me a shout-out and let's try to catch up...and if you plan on doing any races in the next few years, get a hold of me and we'll see about doing them together (high on my list: IM China, IM Western Australia, IM Australia, IM Japan, IM Brazil, IM South Africa). you're all my mates, so good on ya! hope to see you again for many years to come! thanks to my parents--they didn't know anything about triathlon, let alone Ironman. and didn't know anything about New Zealand. but they did so much to come out for this trip, and did a lot to lend me their support. it wouldn't have been the same without them...as you know, traveling with family can be stressful (all the usual family "issues", as you know), but it can also be intensely rewarding (in ways that you can never really describe...). thanks to all you friends and readers--yes, all you friends and readers of my blog. i am so grateful for all the encouragement and support you gave. i've been slow in responding, i know, but i hope my blog makes up for it. there'll be a lot more to come, so stay tuned. it's so comforting to know that we're all part of a community sharing the same experiences...and that Ironman and endurance sports are so great as to provide a connection to the deeper things in our lives. it's about soul, mate. cheers, folks! sacrifices: you sacrifice a lot for Ironman. money. time. energy. body. mind. love. it hurts. but there are some things of the soul that never stop calling you, and you have to answer them for reasons you can't really explain. this race, just like every race, was one of those times. in the end, all you can hope that it is worth it. sometimes i don't know...but we go on anyway. pain: all we do in life is substitute one form of pain for another. the best we can hope for is that we are allowed to choose the manner of our pain. i felt that on all levels this trip. all levels. we are who we are: we are who we are. and we all must travel our own path in life. the japanese elvis: ok, not really. but apparently dave (one of the guys in the tour group) was running alongside a japanese competitor, and tried to strike up a conversation but the man knew only rudimentary english. turns out, however, that the japanese man was an Elvis fanatic, and his parents had taken him to Graceland, and he happened to know every Elvis song by heart (and not only knew them, but understood the words enough to know how to emphasize the lyrics in the right places). dave and this guy ended up singing Elvis songs the entire marathon leg of the race. the war canoe and the haka: the maoris of waireke village (the local tribe historically tied to taupo and lake taupo) did their haka on race day morning. as a bonus, they rowed their war canoe during the swim, and held a constant maori chant while they paced us on the out-bound leg of the swim course. an amazing experience. 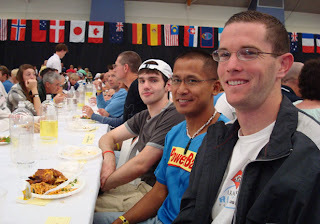 probably the best part of race day--or any race day of any triathlon of any distance that i've ever had. i'd do the race again for this experience alone. there's nothing like a war cry to the gods to keep you going. the lifeguard: i have a bad reputation of not being able to swim in a straight line in open water. that was really proven this time, with my back in such bad shape that it seized up every time i tried to sight. near the end, a lifeguard on a surf-ski paddled over to me, tapped me on the head, and said in the driest new zealand accent of utter pity: "mate, maybe it would be just better if you followed me...i'll lead you in..." yeah, i know. what can i say? the kid with the mars bars: an aussie friend of mine warned me that the candy in australia and new zealand was different (even the US candy is made differently there). no kidding. on race day they had mars bars at the aid stations. i kept resisting the craving for one, until i got to an aid station with this little kid (probably 8-10 years old) holding a gigantic tub of mars bars. he held up the tub to me, and i finally gave in and grabbed one...and then i took another and another and another and another and the next thing i know i had an armful of them...i. could. not. stop. myself. freakin' mars bars, dude. ridiculous. the wedding party: 2 of the members of our group got married the day after race day. they didn't if they could get a marriage license as international visitors, or if they could get a chapel on short notice. but they found out they could, and also found out they could get a chapel. so they got the marriage license and the chapel. we had discussions about having people from the tour group in the wedding party, but my parents wanted to get out the day after race day and i wasn't able to make it. the man with the brain tumor: tony jackson, with mike ramsay, has done every IMNZ since the beginning. 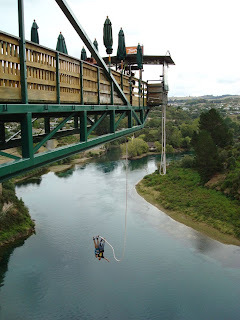 tony had a brain tumor removed this past december, but still came and did this IMNZ with his wife. just goes to show you that Ironman is in many ways about relishing life...while we still have it. yet another one of the fundamental truths of existence drawn from Ironman. the man with the broken toe: another of ian and adrienne's adopted athletes, michael, broke his toe 2 weeks before race day. but he still did the race...and finished. think about it: an entire Ironman on a broken toe. yeah. either you are an Ironman or you are not, either you are a hero or you are not. exactly. the lower back and feet: pretty much my story this race. my strained lower back never really got better by race day...basically, it felt like a giant hand of nails and needles was constantly yanking at my tailbone and erector spinae. i had to stop at every aid station to treat it. it stopped me from being able to sight on the swim or get in the aero position on the bike. as for my feet--well, with conditions being so wet, it rubbed the skin off my feet, and i bled through my shoes quite nicely. for all that, like i said last post, i still had a personal best time...which makes me think that if i'd been good all together for this race, i might have actually met my long-held goal of finishing in daylight--my legs were feeling good this race, really good. i'm thinking it'll be even better next time. advil: i did something i probably shouldn't have done. my back pain was so bad that i took 2 advil every hour after i got done with the swim. all told, i think i took a total of 26 advil on race day. not good for the kidneys. but i was hurting pretty bad. and i wanted to finish. so i figured i'd do whatever it took. i'll try not to do this again. race day: okay, windy and rainy. all day. and worse once the sun went down. not quite as bad as IMAZ last year, so i used my experiences from then to help me through the conditions here. but every local i met apologized profusely for the weather and said this was not typical for new zealand summer. was it cold? well...people in our group got hypothermia (michelle, a canadian of all people, got pulled off the course by race officials when they found her lips had turned blue). but for someone used to swimming in southern california surf of 15-17 degrees celsius, it wasn't really that bad. didymo dave: this was the appellation rob and i gave to a representative of the new zealand ministry of forestry (i think that was the name of the department) who had the job of sterilizing all wetsuits against didymo, a foreign bacteria (especially the US) that has been terrorizing new zealand's fresh waters. the man was the funniest character i met the entire trip, with a sharp wit, great attitude, and supreme earnestness that did the NZ government credit...hats off to him, for waging a neverending battle for truth, justice, and new zealand's fresh waters against the evil scourge of the deadly dangerous dastardly didymo bacteria! good on ya, mate! the eternal athlete: micky shapiro is a celebrity in Ironman circles. she's 71, and IMNZ was her 21st Ironman. she's done 2 Ironmans a year since she turned 60. ?!?!?!?!?!?! i introduced her to my parents, and i think it rocked their sense of age and perception of aging. i know my mother certainly started to become a whole lot more active in terms of walking around with me in auckland and coromandel. the pro-turned-age-grouper: ken glah is the CEO of Endurance Sports Travel (EST). he is incidentally also a former pro, and not just any pro, but one of the major pros of the '80s and '90s. i was surprised at just how famous he is. but if you meet him, he's probably one of the humblest, nicest guys you'd ever meet...and you'd never know he was a 2-time winner of IMNZ and 22-time top-10 finisher at the IM World Championships. what was really funny was that even though he was running this trip, he was still racing this IMNZ. amazing. he's racing age group now, which i figure must be a strange feeling (as in: to go from being a major pro to another member of the age group amateurs)--but i guess we all get older, and we all are just people in the end. the overworked masseuse: lisa was a friend of blair's (see below) from their hometown of taranaki. i ended up going to her twice before race day to try and get my back into shape for race day...it helped, but my back was just too far gone to be up to top shape for IMNZ. i love her comment to me the 1st session: "um...really tight there...maybe you should consider just taking a few days and doing nothing, yeah?" yeah. exactly. she was working non-stop at several points giving massages to everyone in the group. i felt for her--and her hands. the drafted aussie: dan was never supposed to be part of the EST staff. actually, he'd only come to IMNZ to cheer on micky as a friend. but he showed up in taupo, and found himself drafted as a bike mechanic (cuz that's his business back in melbourne, where he's from), cook, guide, shuttle driver, and baby-sitter to a bunch of clueless americans. for all that, he held up his sense of humor, positive spirits, and was--with blair--one of the most hilarious people to be around. between him and blair and their attendant task force of aussies and kiwis (they'd brought some of their mates as well), they were absolutely a riot. aussie aussie aussie!!! oi oi oi!!! the last-minute kiwi: our bike mechanic, blair, was invited to be a last-minute entry (as in: the day before the race) into the race. but he had to turn it down because he loaned his bike and wetsuit to one of the people in the group who had lost his equipment on the flight to new zealand. blair, of course, had done no training. but i would have paid money to see him do an Ironman as a last-second entrant--rob, justin, and i talked about it, and we all had the distinct impression that blair is the kind of guy who could have dropped the hammer AT ANY TIME and absolutely destroyed EVERYONE (with the exception of dan and ken) in the group without even thinking about it. truly humbling. the post-race pub crawl: our bike mechanic, blair, told me his tradition with ken after finishing every IMNZ was to walk back from the finish line to the hotel (about a mile) and stop on the way to get a couple of beers at the pub. ?!?!?!?!?!?!?!?!?! i thought he was joking, and then i realized he was being serious. i thought he was still joking, and then dan said they do it all the time. and even then i thought he was still joking, and then i heard that ken did exactly just that after the race. ?!?!?!?!?!?!?!?! note to self: goal in life is to get into good enough shape to do this. seriously. the aussie-kiwi rivalry: there's definitely a good-natured rivalry between the 2. my favorite illustration of this was a t-shirt that read: "i support 2 teams: the all blacks, and whoever is playing against australia." rugby: rugby is a freakin' religion in new zealand. god forbid you don't worship the all-blacks. we stopped at eden park while on the Explorer bus in auckland, and everybody fell into awed whispers when the driver announced that this is where the all blacks play. cleanliness is a virtue: actually, this applies for ALL of new zealand. the cleanliness is amazing. it rivals scandinavia--and coming from a eurasian swede like yours truly, that's saying a lot. every toilet i saw (public or private or business) was spotless. the streets were likewise spotless. the parks and forests and trails and towns and alleys were similarly spotless. even on race day, they had gigantic trash bins with massive bulls-eyes with huge signs saying "place rubbish here"--and at every aid station. it warmed my heart to no end. international competitors: as i mentioned, IMNZ is the most international of Ironman races, with over 40 nations, and this is 2nd only to the Ironman World Championships in Kona. what's interesting is that the biggest contingent this year went in order of Australia (with ~180), the US (with ~120), and then Japan (with ~70...!! !...there were so many of them that they had their own race briefing to translate race instructions). to make my dad happy, Sweden had 4.
race swag: daaaaaaaaaamn, but IMNZ has some awesome swag. especially if you love black. yeah, i know, it's the official new zealand color (hence the national rugby team name: all-blacks). but wow, it. is. all. black. and very pretty. and it puts the stuff i got at IMAZ to shame. i bought as much IMNZ stuff as i dared to buy on my student budget. maoris: fascinating. 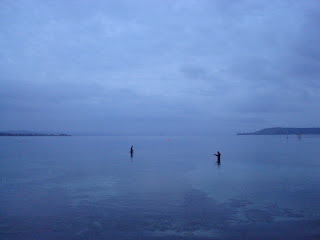 in taupo, i had the maori channel on my tv. i ended up watching it most of the time i was there. they're definitely politically powerful and very assertive. i also found all the maoris i met to be very proud, very warm, and above all, very spiritual. i sense their culture is one that respects the unknown mysteries of existence--something definitely gratifying to me, coming from a place (the US) that seems to miss out on so much of it. i know the maoris have an image of being very warlike and have their own societal problems (but then, don't we all), but i found them a great culture to be around. rampaging drunk underage new zealand teenagers: the night of IMNZ featured random roving hordes of drunk teenagers rampaging through the streets of taupo. joe (ken's brother) joked about this, and blair told me that they were all definitely under the legal drinking age in new zealand. lisa told me that this was a definite problem in new zealand, and a couple of tourists i met in a taupo souvenir shop said it also stretches to australia as well...the problem isn't the drinking, but the binge drinking, which there is a lot of--sounds a lot like the US. drinks: ok, so i heard that the native New Zealand drinks to have are L & P and Frank's ginger beer. both are (sort of) equivalents to U.S. root beer (read: non-alcoholic...i think). my response? good. but in a weird tickle-your-taste-bud-and-mind-sort-of-way. personally, i prefer the ginger beer, not just for the taste (surprisingly good) but also the awesome motto on the bottle: "Frank's Ginger Beer: A damn good beer, a damn good drink". 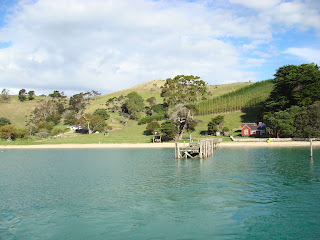 lamb, beef, dairy, shellfish: if you're not into any of those, then you're going to be SOL in new zealand. oh they have vegan and vegetarian stuff, don't get me wrong. but all their famous cuisine revolves around just those 4 things--and in various order depending on who you're talking to: lamb, beef, dairy, shellfish. 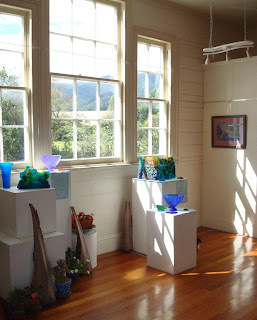 the truth train: the driving creek railway in coromandel (see below) is an artist's commune for glass, clay, earthenware, and sculpture. the founder funds it by maintaining a scenic mini-railway up into the forests of the coromandel mountains. start point of the train had a sign that read "i am looking for a truth train" (see photo above). all i could say was: exactly. i labeled the train the "truth train." i loved it. it became my motto for this trip. 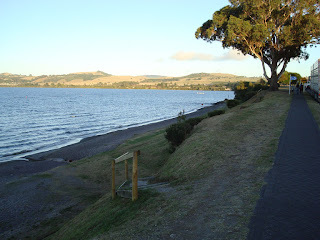 taupo: and lake taupo. phenomenally beautiful. i really could get used to living there...really get used to living there. for all that, everyone kept telling me it was nothing compared to the south island. hmmmmmm...note to self: honeymoon place. my only caveats are that taupo is becoming a retirement home catering to wealthy vacation visitors, meaning that the food and shop prices are high. the land supposedly is high, but compared to the prices in LA, the land in taupo is cheap--i checked out a real estate catalog while there, and they had beach-front 3-bedroom homes going for $NZ300-400,000, which is obscenely cheap compared to the cost of a beach-front home (or, for that matter, any home) in LA. note to self: buy land in new zealand. auckland: ignore the tours (very crowded, very pricey, very hectic). take the Explorer bus (a bus service that goes in a loop around the major city neighborhoods...$30 for a 2-day pass, unlimited get-on-get-off, very casual, and very relaxed). 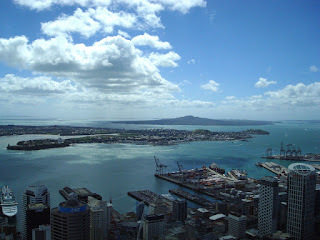 major sites i'd recommend: sky tower (go on a sunny day...amazing views of the city--see my photo albums above), auckland national museum (the maori collection is fascinating...and one of the most educational things about new zealand i saw), mt. eden (an extinct volcano w views of the city), and victoria market (if you want tourist souvenirs at 1/3 of the price of other places, this is the place). new zealand: as i've been telling people: ridiculously clean, ridiculously nice, ridiculously happy, ridiculously beautiful. standard of living, quality of life, whatever. it was really hard getting on the plane to come back to Los Angeles, which in comparison is a cesspool with incredibly disturbing income inequality. say what you will, but what i saw in new zealand was an ideal middle-class-based economy living in a democratic society with a clean environment and all the modern amenities and superb education and health care...i'm worried that the U.S. is none of the above, especially since it seems we've become a feudal economy, with an upper class that holds all the wealth and lords over the remaining peasant populations slaving away beneath them. 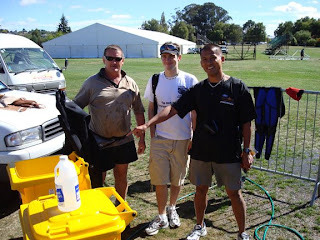 Ironman New Zealand: i can summarize it as this: do. this. race. oh my god. do. this. race. the best race course, the best volunteers, the best host town, the best experience i've had with Ironman...of course, my only prior experience has been doing IMAZ twice. whatever. this race is a must-do. for any Ironman. for anybody. you. must. do. this. race...and then hang out in new zealand and come to your senses and get a clue as to what life is really about. well, that's pretty much it for now. i'll try to get the race report up soon. 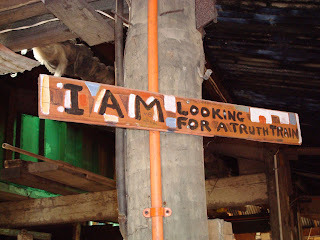 and oh yeah: i am looking for a truth train! Dude Sounds like you had a blast down there (post race, next year I plan on taking an extra week to explore the area. )Also tylennol tends not to have the same after effects of advil if taken during exercise. Thanks for the shout out in the balchelor pic, hope all is going well. aw thanks mate! let's round up justin and dan and blair and see about doing this again sometime!